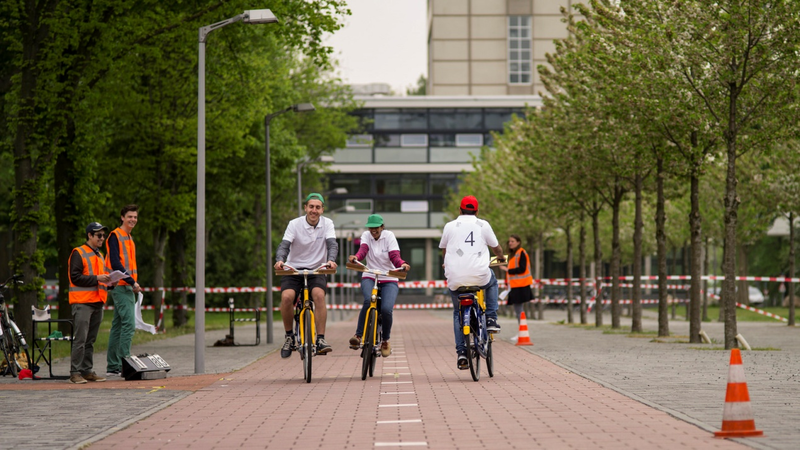 On the 10th of May, a controlled experiment to study cycling behaviour was performed. This experiment collected bicycle trajectory data in unhindered and interacting situations to get insight into cyclist behaviour. The resulting datasets can be used to study interaction behaviour of cyclist flows, to calibrate the newly-developed cyclist model, to validate and develop new/improved theories of cyclist behaviour, and to facilitate other related bicyclist research. 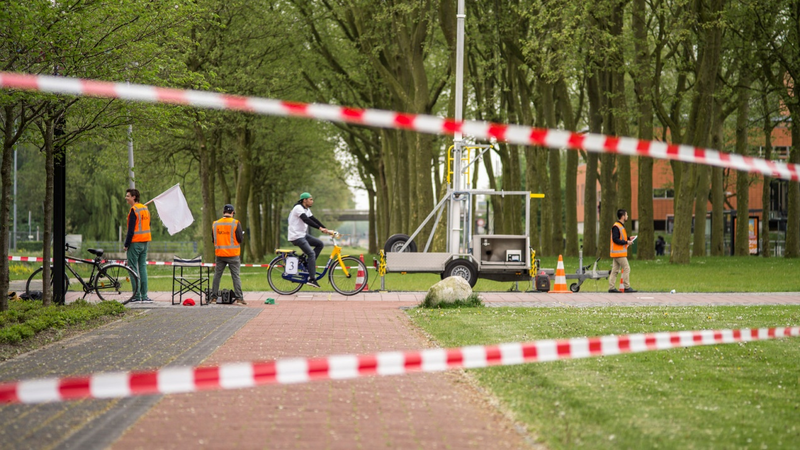 This experiment, part of the ALLEGRO project, was supported by 4 master students, 12 experiment participants and colleagues from the Transport and Planning laboratory of TU Delft. It took place at the Berlageweg – a bicycle path – intersected with the main bicycle path in front of the CiTG building at the TU Delft campus. Participants conducted predefined manoeuvres under unhindered and interacting situations. In the unhindered situation, participants started, stopped, and cycled as they liked. In the interacting situations, cyclists were overtaking or they had face-to-face encounters. The experiment was recorded with video cameras located above the experiment area. All bicycles were similar OV-bikes, so only the behaviour of the cyclist was observed, not the behaviour of the bike. Each participant was equipped with identifiers (coloured hats, number tabs, etc.) for video capturing and monitoring purposes, so they could be recognised in the video footage. Now extracting trajectory data from video footages is in progress. The Allegro-project is funded by Horizon 2020, the biggest EU Research and Innovation programme. The support was granted by the European Research Council.